NFL owners are still debating where they stand collectively on the issue of players refusing to stand individually. At the league meeting in Atlanta on Tuesday, no consensus was reached on how the NFL should handle players who don't want to stand for the national anthem. ESPN reported that numerous options were discussed, including one that would assess a 15-yard penalty and/or a fine if players don't stand. Other possibilities, per ESPN, include letting each team set its policy, clearing the field of all football personnel during the anthem, telling players who won't stand to remain in the locker room during the song, changing contract language to require standing for the anthem, or maintaining the status quo. MMQB's Albert Breer tweeted, "Per sources, one anthem idea being discussed: Leaving it up to home team on whether teams come out for the anthem; if teams do come out for the anthem, potential that teams could be assessed 15-yard penalties for kneeling." 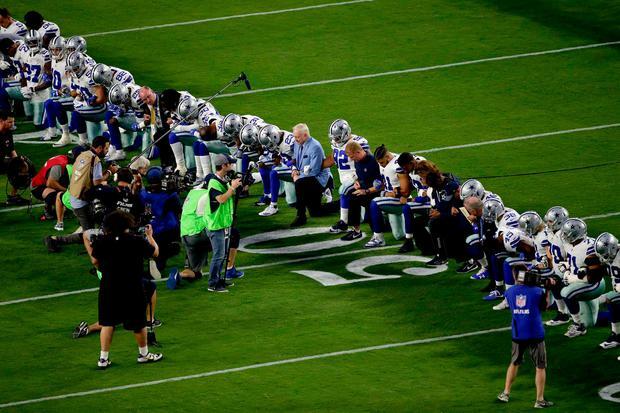 Currently, NFL regulations say that players "should" stand for "The Star-Spangled Banner." The issue exploded into a national debating point the past two seasons. Then-San Francisco 49ers quarterback Colin Kaepernick refused to stand for the anthem as a form of social protest beginning in 2016, and other players followed. Last year, President Donald Trump ripped players who refused to stand for the anthem, and he called on the NFL to sanction those players who didn't stand. "We have all the interests in every constituency that's involved here," Dallas Cowboys owner Jerry Jones said. "We recognize that with our visibility and the interest themselves, it's taken on a life of its own. With all of that, we have to be measured. "We tell the world, 'Look at us. Don't turn your head. Look at us. Wait a minute. Look at the NFL, look at what we're doing.' And we understand that when you have some issues, we've asked you to look, now, so let's do as good as we can do." Jones, New York Giants owner John Mara, Pittsburgh Steelers owner Art Rooney and New York Jets owner Woody Johnson told USA Today Sports that talks about the subject were to continue into Wednesday. Mara told ESPN he thought a consensus could be reached. Detroit Lions president Ron Wood told the Detroit Free Press, "My preference would be to find a solution that works for everybody and it's done at a league level, so we'll see what happens the next couple days." Jones said Tuesday night, "I don't want to assess where we are tonight. We'll resume tomorrow. I wouldn't assess right now."